The inspiration behind this recipe is mum who I spoke to a few days back. Dad had told me that mum had baked some awesome pumpkin cake which was creating waves amongst friends and family who tasted it. So I quickly asked mum on how she got the idea of putting the gory pumpkin into a cake??? I have had a repulsion to pumpkin since my boarding years at SFX ( no offence to our lovely nun chef who cooked us our meals....but the soggy pumpkin vege was horrific!!). Every time we got served pumpkin I would wrap it in banana skins and bin it....(sorry sister M). Anyways, mum told me that lil sis had picked up some groundnuts on the way home. Once she was through eating the groundnuts she threw away the paper packet. For some reason mum decided to read the paper packet before binning it, when she discovered a rather non descriptive recipe for a pumpkin cake (the new heights of observation!!). Mum instantly liked the idea of introducing pumkin into a cake and decided to adapt it with her famous carrot cake recipe. The cake turned out to be moist, light and loved by all. A yummy way of getting a portion of fruit and veg....hmmm..
Coming back to the recipe for this cake.....went out shopping for a pumpkin.. and foolishly picked up a butternut squash instead . Thought of how I could camouflage it into a cake...and decided on the most effective method...within a chocolate cake( my favourite). Hence I adapted the butternut squash into my favourite chocolate cake recipe. The result was 2 absolutely soft moist chocolatey perfectly edible butternut squash cakes. Incredible. Food fact: Butternut squash also known in Australia as Butternut pumpkin, is a type of wintersquash. It has a sweet, nutty taste that is similar to pumpkin. It has yellow skin and orange fleshy pulp. When ripe, it turns increasingly deep orange, and becomes sweeter and richer. It grows on a vine. Butternut squash is a fruit that can be roasted and toasted and also be puréed or mashed into soups, casseroles, breads, and muffins.It is a good source of fiber, vitamin C,manganese, magnesium, and potassium. 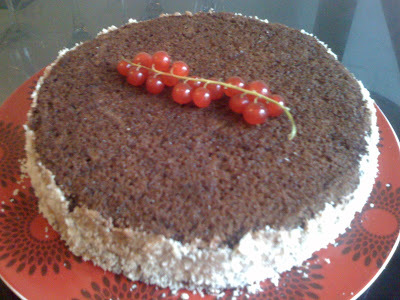 It is also an excellent source of vitamin A.
I made 2 cakes with this recipe. One big cake 21 inches in diameter and second 8 inches diameter( both cakes had 2 layers). Line the bottom of two 21-inch cake pans and two 8 inch cake pans with parchment paper and lightly butter. Sift the flour, cocoa, baking powder, baking soda, and salt together. Stir the buttermilk, pumpkin, and vanilla extract together in a small bowl. Beat the butter and sugars together using an electric mixer on medium speed until light and fluffy. Beat in the eggs and yolk, one at a time. Fold in the flour and buttermilk mixtures a third a time. Pour the batter into the prepared pans( 6 small ladle spoons into big cake pans each and 3 into small cake pans). Bake until a tester, inserted in the center, comes out clean--about 12-14 minutes for 21 inch pans and 10 mins for 8 inch pans. Cool layers completely before icing. In the mean time whip 1 cup double cream with 4tbsps sugar, 1tsp cinnamon and 3tbsps cocoa till it forms stiff peaks. Add 3tbsps honey and the cooled squash raisin mixture and fold in gently. Spread the cream mixture between the two layers and the sides of the cake. Decorate the sides of the cake with almond powder. Chill in the fridge. Serve cold preferably the next day.